Have you ever wondered what the designers of your favorite games might think about game design, the state of a game, or games in general? We have the perfect place for you to find out. Today, we’re happy to (re)introduce a series of articles from Fantasy Flight Games: Designer Journals! Designer Journals offer a place for you to hear directly from the FFG designers about some of the topics that are nearest and dearest to them. 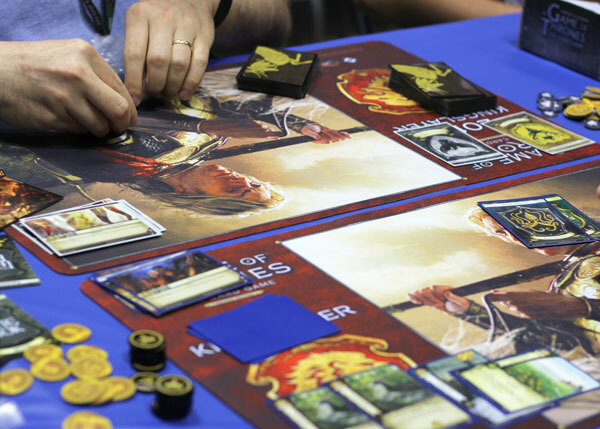 We’ll be starting by featuring articles from the FFG card game team—so to learn more about what you can expect from Designer Journals and to meet the members of the team, just read on! For the first two years (or so) of my career at Fantasy Flight Games—back in 2006 and 2007—I wrote a weekly column known as the “Designer Journal,” which primarily covered the A Game of Thrones collectible card game. For our audience, this column presented a regular behind-the-scenes glimpse of what the designer was thinking and feeling about a variety of topics surrounding the game. For me, as that designer, the writing was an opportunity to critically reflect on how the game was evolving. By forcing myself to collect and share those thoughts, I was able to grow more self-aware in my own role. We can fast-forward through this next part. FFG grew, by leaps and bounds. An ever-increasing catalog of card games placed ever-increasing demands on my bandwidth, and at some point the decision was made to phase out the column. The games kept coming, but gone were the direct line of communication between designer and audience, the regular behind-the-scenes insight, and the ongoing opportunity for public self-reflection. As the years raced by, I continued to carry fond memories of the Designer Journal. I knew that it would be impossible to return to the old practice of maintaining a weekly column for each of our games, but I couldn’t help wondering if there might be a way to re-imagine the column and capture its spirit in a way that meshed with the current demands and workflow of our department. Thus, the pitch for “Designer Journal 2.0” was born. A State of the Game article, in which the designer shares their thoughts on the current state of the metagame, and what they’ll be focusing on in upcoming development. A Round Table article that invites a number of different designers to each provide a short answer to a single question. A discussion or examination of a broader topic that relates to gaming or game design, investigated through the lens of the designer’s particular game. An interesting story or anecdote that took place during the development of a product. A retrospective article that looks back at past expansions and discusses how their impact compares to our expectations while we were developing it. What worked? What surprised us—for better or worse? A Designer’s Feud article, in which two designers each present a different side of a debate regarding gaming or game design. The ultimate goal of the Designer Journal is to bring you, the reader and fan of these games, just a little closer to the FFG studio and give you an opportunity to get to know the people who craft the experience. So, who will be contributing to this column? We’ll be starting with the FFG card game team, introduced below! Caleb Grace is a designer for The Lord of the Rings: The Card Game and has been with the company since 2011. In his spare time, he enjoys comic books, spending time with his kids, and Mountain Dew. Law school graduate Matthew Newman is a designer for Arkham Horror: The Card Game, and he’s also contributed to The Lord of the Rings: The Card Game. For fun, he loves video games, massive multiplayer games, books, and movies—particularly if they deal with horror or high fantasy. He believes he would like free chicken wings, but has never actually received any. Danny Schaefer is a designer for A Game of Thrones: The Card Game, and first started with FFG as an intern. In his free time, he enjoys Magic: The Gathering, basketball (Go Timberwolves! ), and spiking volleyballs on members of the board game department. 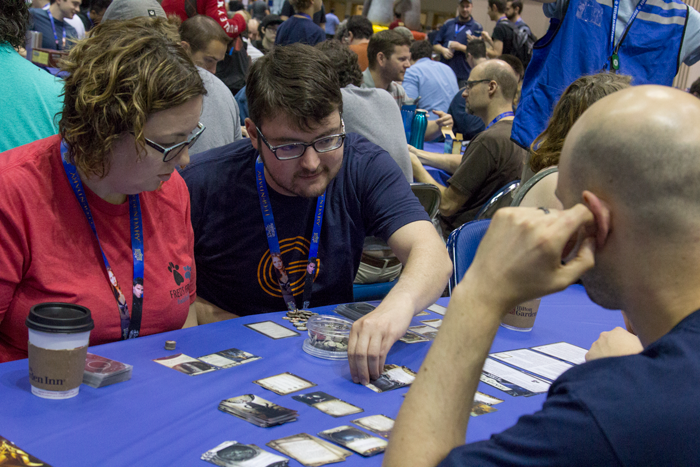 Former five-time LCG® World Champion Jeremy Zwirn began his work in the gaming industry as a playtester, and he has since worked his way into a design position for Star Wars: Destiny. In his spare time, he enjoys cheering on the Minnesota sports teams, biking, and “scooping” people—which roughly translates to winning. The enigmatic Michael Boggs is a designer for Android: Netrunner, a contributor to Star Wars: Destiny, and a man of many nicknames. Boggsy, Boggle-Woggle, the Bogginator, Michael Buggs—call him what you will, he’s heard it all. Before joining FFG, he worked as an English teacher in South Korea. For fun, he enjoys… well, no one knows. Maybe Olive Garden? Tyler Parrott (who is secretly a parrot) is a designer for Legend of the Five Rings: The Card Game, and also contributes to Star Wars: Destiny. After playtesting LCGs for many years, he took an FFG internship, transitioned to a freelance designer, and finally landed a full-time design position. For fun, he enjoys medieval/renaissance music, singing, and sandwiches—so long as they don’t have pickles on them. Last but not least, card game team manager Mercedes “Cardeesi” Opheim started with FFG as an LCG graphic designer, and transitioned to management in January 2017. In her free time, she enjoys drawing, painting, kickboxing, and coming up with new names for her fists. She is also the proud parent of two of the most adorable kitties in the western hemisphere. We hope you’re as excited to hear from us as we are to write about these games! Until next time, good luck and happy shuffling! Nate French is the longest-tenured member in the card game department, and he serves as a mentor and coach for the team. More often than not, he’s working on a project he can’t say anything about… yet! In his spare time, he is an avid poker player and enjoys reading, writing, sports, (older) heavy metal, and talking about LeBron.